Cancer- just hearing the name of this terrible disease is enough to send a chill down your spine. This as-yet incurable illness has touched the lives of so many people; you would be hard-pressed to find one person who doesn’t know somebody who has been affected. Due to its prominence in today’s society, there are many books around that broach the subject of cancer including self-help books that feature preventative measures, memoirs by sufferers of the disease and biographies by some of the people who care for them. But few of the books that have been written come from the perspective of a teenage girl (with contributions from her family and friends), and no other features an introduction from popular teen book author John Green. Esther Grace Earl was only twelve when she was diagnosed with thyroid cancer. Even before her diagnosis, Esther was an avid reader and writer, and loved to create stories for her family. This love of words inspired her to write a journal, in which she recorded all of the important things in her life, including the unbelievable moment when she discovered she had cancer, and the subsequent years of drug therapy that she endured to try and beat the disease. Although Esther lost her battle with cancer in 2010 (just after turning sixteen) her family made sure that her dream to be an author eventuated. They released a book in her name that features her journal entries, illustrations and photos, and words from a host of people that were important to her. 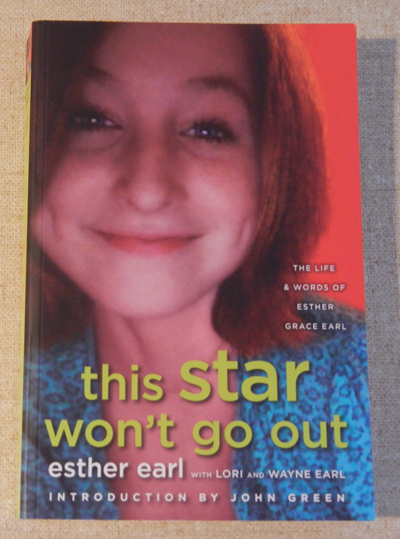 This Star Won’t Go Out (named for a phrase that accompanied a charitable foundation that Esther was involved in) is an inspiring book, which highlights the generosity, positivity and gracefulness of this teenage girl, despite her deteriorating health. There are countless tributes to Esther throughout the book from her real-life and online friends (she had a blog and a large internet presence on certain websites), her brothers and sisters, her parents, and virtual strangers who heard about her story. Also contributing to this book is award-winning author John Green (who became a friend of Esther’s over time). In fact, his internationally bestselling novel The Fault In Our Stars (which will be released as a film in June 2014), is said to be loosely inspired by Esther’s story, and the book was dedicated to her on its release in 2012. If you want to read an inspiring book about a very real girl determined to overcome all that cancer threw at her, then this is the book for you. A lover of all things Harry Potter, Esther also loved her pet cats, various websites that explored ‘nerdy’ subjects, and creating YouTube videos. She strived to find the positives in everything, even when she was feeling depressed or breathing became difficult. Although some of the moments she writes of can be difficult or emotional to read, the overriding feeling when reading this book is one of hope. In publishing these memoirs, Esther’s family has ensured that her star really won’t go out.